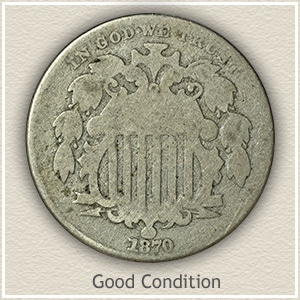 High 1870 nickel value shows just how scarce these coins are. 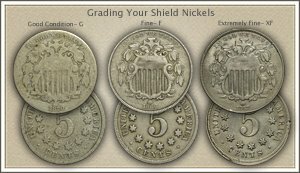 Your Shield Nickel, as it is known to collectors, is a rather elusive and historically important part of the first nickels minted by the United States. 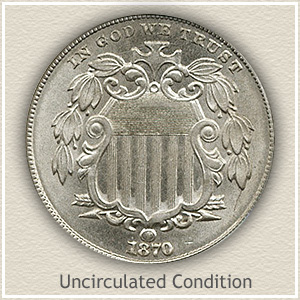 For example: The "Uncirculated" 1870 Nickel pictured is an outstanding high grade coin, and worth $119 or more. Uncirculated: Radiating with the shine of a new coin, mint luster is still present over the entire surface. An uncirculated coin shows no signs of wear. If wear is present, breaks in luster occur on the Cross, the leaves, and frame surrounding the Shield. 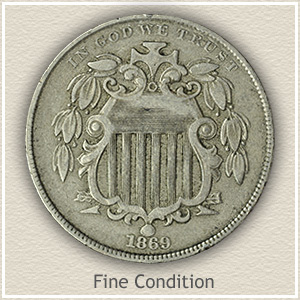 Fine: Most of the minor details have worn away on a coin in Fine condition. The interior details of the leaves, the outlining of the cross and most of the shield's finer design has worn and merged. On the reverse the stars are worn smooth and the lettering is becoming weak. Good: In "Good" condition your 1870 nickel value is at the low end of the range. The design is worn to the point just the outlines of the major details show. The date although very weak is readable. However the lettering has begun to merge with the rim and themselves. The shield, leaves, and cross are only flattened outlines with no center details. The numeral "5" on the reverse is very weak and often missing in parts. Lettering and stars on the reverse are heavily worn and becoming faint. Few coins in the Shield nickel series combine intense lustrous mark free surfaces and "Light Toning." The 1870 nickel in the image was bid to a high of $1300 at a David Lawrence Rare Coin Auction. Attracting many collectors attention the blue-grey gem in the center required a bid of $1265 from one astute collector to add this coin to their collection. Eye appeal sets the "Golden Gem" apart. Bright luster shinning through warm toning and few marks or abrasion puts this nickel in demand from both dealers and collectors. 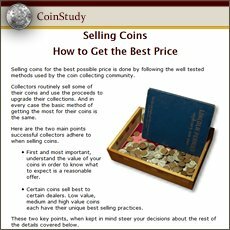 The coin sold for $552 a very strong price. 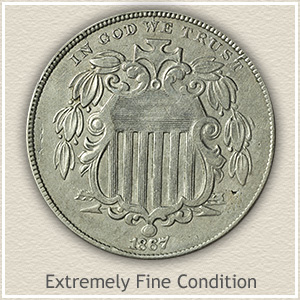 All thee examples are part of a select few high quality survivors of 1870 nickels. Including more relating to your 1870 nickel value. 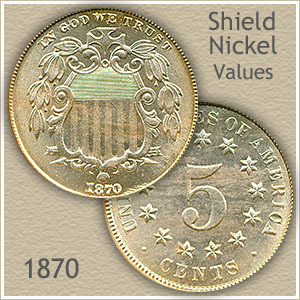 Other nickel series are described, value charts provided and linked to... Liberty nickels, followed by Buffalo nickels and the current Jefferson Nickels.